Mera Aadhar Meri)Download Online, Update / Correction in Your Aadhar Card, Find Your Enrollment No. and Other Various Information Are Available in Single Portal UIDAI Every Indian People Are Must Enrollment with UIDAI Aaadhar Card. No Any Application Fees for the Aadhar Card Enrollment, E-Aadhar, Online Correction Form, Find Your Lost UID and All Services of UIDAI is Totally Free Service in India. Enter Your 14 Digits Enrollment No. Or 12 Digits Aadhar Card No. to Get OTP (One Time Password) On Your Registered Mobile Number. Enter Your OTP (One Time Password) For Download Your Aadhar Card. Note – E-Aadhar Card Default Password is Your Name’s 4 word and Your date Of Years. If You have to Forget the All Details (Example – Enrollment No. and Aadhar No.) Kindly Use the Find UID Option And Fill required Details. Find Or Visit Your Nearest Enrollment Center to Choose Your State Name, District Name and Area. Go to Aadhar Card Enrollment Venue or Center and Submit Your Documents and Other Related Documents Photo, Bio-metric Details-Airis,fingerprints etc. After the A Few Days, Your E-Aaadhar Generate and is Available on The Portal. After the Sucessfully Generating the Aadhar Card if you See Any Correction in Aadhar Card’s Details. 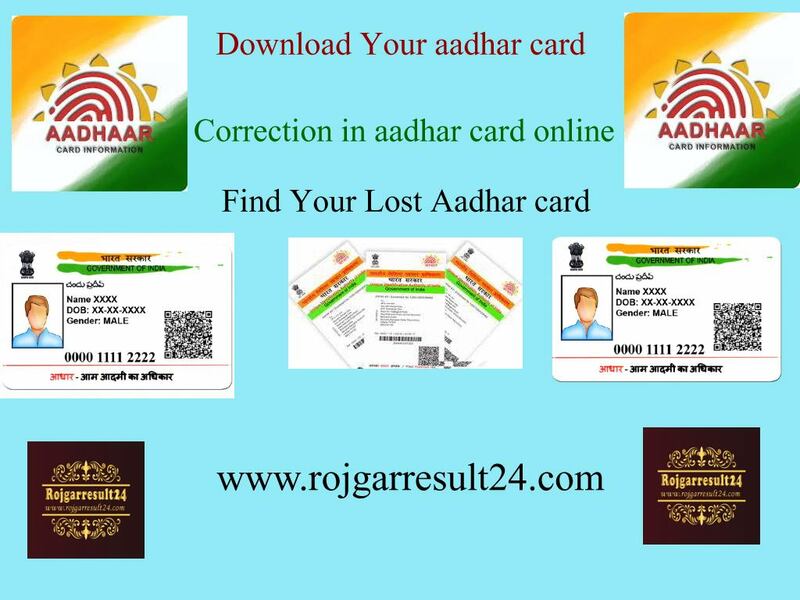 For Any Correction Kindly Use Only Aadhar Card Correction Online or Visit Aadhar Enrollment Center. After the Over the Correction Procedure Wait for the A Few Days and Download Your E-Aadhar. And Use Your E-Aadhar for Government Schemes Or Banking, Mobile Sim Card.